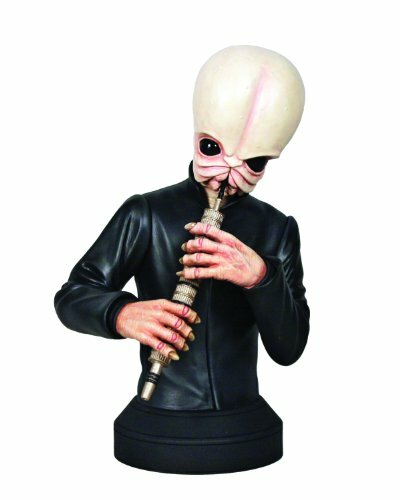 It’s been a while since I did a post of gift ideas for Star Wars fans so today we have a post dedicated to the Cantina Band from Mos Eisley on Tatooine. I remember queueing around the block to see the first Star Wars movie (now labelled as IV A New Hope) and although I haven’t watched the movie more than about 5 times over the years, I do remember the Cantina Band and their music. 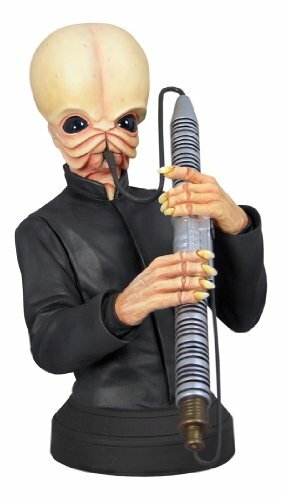 This box set of 5 Cantina Band members is part of a Bust Ups series – finely detailed half figures which make great gifts for Star Wars memorabilia collectors. 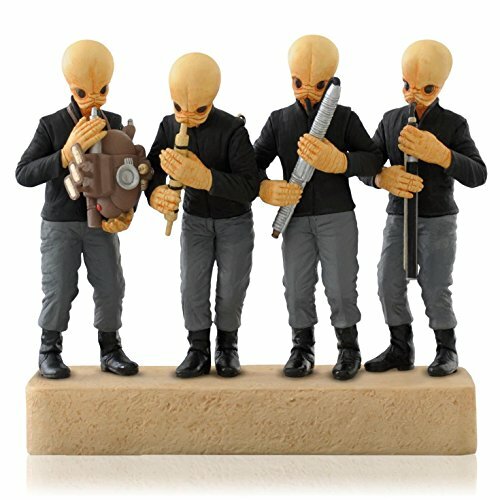 The Cantina Band Keepsake ornament is a Hallmark product and shows four of the band members mounted on a base. It also plays the Cantina Band’s most famous song if you remember to keep charged batteries in it! It would look great as part of a Star Wars display. My favorite is the art print though – it shows the heads of the Cantina Band on the bodies of the Beatles Sgt Pepper’s Lonely Heart Club Band. I’d guess that reference is possibly lost on a younger generation though! The two mini-busts are limited edition 1:6 scale collector’s pieces which are about 6 inches tall and as you can imagine, are pretty rare finds. They are numbered and come with a certificate of authenticity so don’t let your little ones play with them ok? 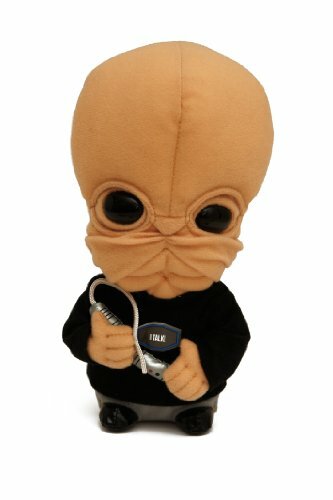 lol The talking Cantina Band member plushie doesn’t actually talk – it plays the theme song which I think is probably better than talking. Lastly we have some clever t-shirt designs to show you. The first one is designed to look like a poster advertising the band live at the Cantina which I think is a brilliant idea. 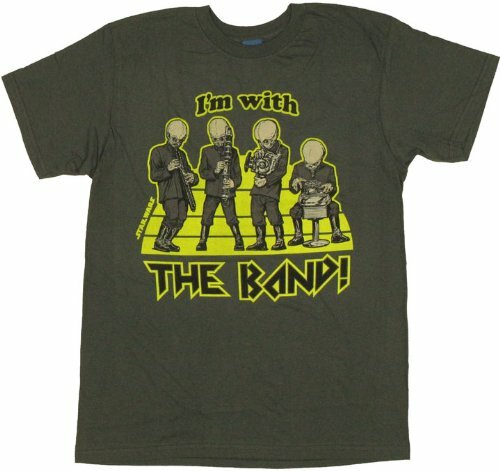 I also like the middle t-shirt – it uses the common phrase ‘I’m with the band’ and shows the Cantina Band playing their weird instruments. My favorite though is the Cantina Road design – another Cantina Band/Beatles mash-up – this time from the Beatles album Abbey Road. 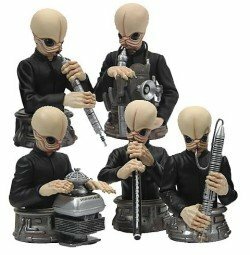 I hope you’ve enjoyed today’s brief look at gifts for fans of the Star Wars Cantina Band. There are quite a few posters and other memorabilia available too but I didn’t feel qualified to talk about the really rare stuff! The Cantina Band is also available as part of the Lego Cantina Set though so if you are a Lego fan as well as a Star wars fan, don’t forget to check it out! If you’re looking for more general Star Wars gift ideas, you can check out our growing list of Star Wars gifts posts. Great Star Wars Socks – Socks Don’t Have to be Boring! If you would like us to find a perfect gift for someone, just leave us some details in a comment on any post or you can contact us via Twitter @giftsgamersgeek or our Gifts for Gamers and Geeks Facebook page. If you’d just like to keep up to date with our posts, you can sign up for our mailing list too. 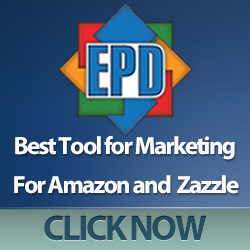 We don’t spam and we won’t sell your details to anyone else either.